Preheat oven to 325°. Line a baking sheet with parchment paper or a Silpat. Heat cherries and liqueur in a small saucepan over medium-low heat, stirring occasionally, until cherries have softened, about 8 minutes. Drain, reserving 2 tablespoons liquid. If you need more add enough liqueur to make 2 tablespoons. Sift together flour, baking powder and salt into a bowl. Put butter and sugar in the bowl of an electric mixer fitted with the paddle attachment; mix on medium speed until fluffy, about 2 minutes. Mix in the 3 eggs, one at a time. Add reserved cherry liquid and the vanilla. Reduce speed to low, and gradually mix in flour mixture. Stir in cherries and pine nuts. 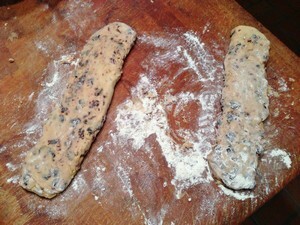 On a lightly- floured surface, divide the dough in two. Shape each half into a 12 1/2 by 2 ½” log. Flatten logs to 1/2“ thick. Transfer to the baking sheet. Bake 35 minutes, rotating sheets halfway through. Transfer to wire racks to cool, about 20 minutes. Reduce oven temperature to 300 degrees. Cut each log on the diagonal into 1/2″ slices. Transfer pieces to racks, laying them on their sides. Set racks on baking sheets. Bake 8 minutes; flip them and bake 8 minutes more. Let cool until crisp. Optional chocolate: melt the chocolate in a double boiler or in the microwave (30 second intervals). 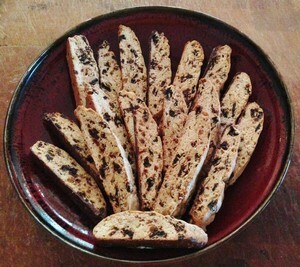 Paint a thin layer of chocolate on the bottom of the biscotti, or just dunk them in and coat one side. Let cool on a wire rack. Serve and enjoy! My verdict: I’m not a dunker of things into coffee or tea–something about crumbs at the bottom of the cup never appealed to me, so there are a lot of cookies I prefer to biscotti. 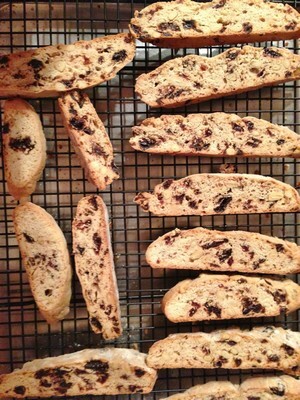 These came out fine and Frank, the biscotti lover in the family, thought they tasted great (and would I please make another batch). We’ll have to wait till after the holidays to see what Laura’s father thought of them. I substituted pine nuts for the almonds Martha called for, but did soak the cherries in Amaretto. Dried cranberries would also work instead of the cherries.